Be sure to read through my counter service reviews from 2012, as well as the preface notes for a few more details! If you haven’t already, here is a summary of my 2012 trip report, too. Just a note: I wrote this in one jaunt, all 7600 words worth, and I might have left out details or became repetitive with my deliciousness-preaching. Feel free to hit me with questions in the comment below or via email if there is anything you’re wondering about the meals, the servers, the chefs, the menu, or something I might have missed! We chose Sanaa based on a good experience last year (allergy-wise), as well as for the fact that we really enjoy the food there! Because I had eaten there so safely, I wanted to eat somewhere I trusted since it was the night before the run, so that is why I chose here. Mom was all too happy to comply – she also loved it here. Our server here was awesome, his name was Alan, and the chef was Chef Bob. He brought over a gluten-free menu and a vegan menu (both of which they didn’t have actual hard copies of last year, so that was pretty awesome). It also made it easy to cross reference what they had available. The menu was similar (or perhaps the exact same) to last year’s menu. 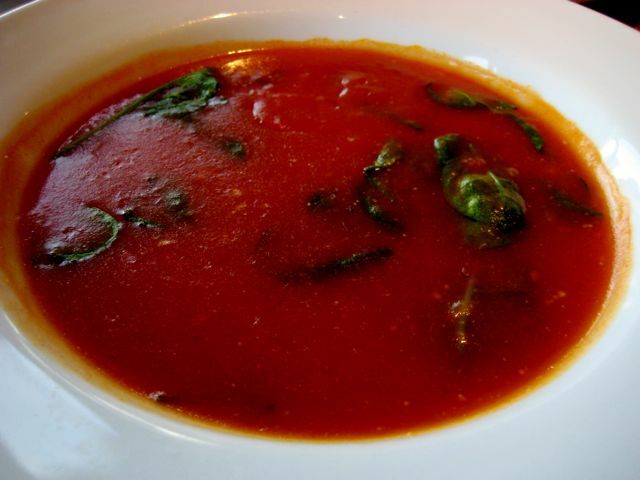 We opted to start with the Tomato and Spinach Soup and the Indian Style Bread Service. 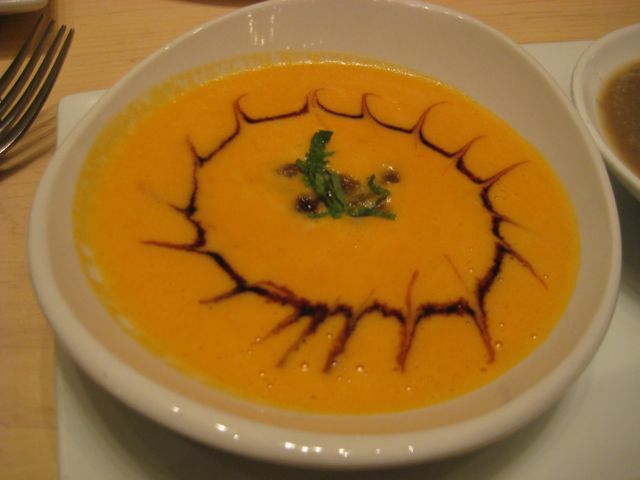 The Tomato and Spinach Soup is their vegan alternative to the Tomato and Paneer Soup. 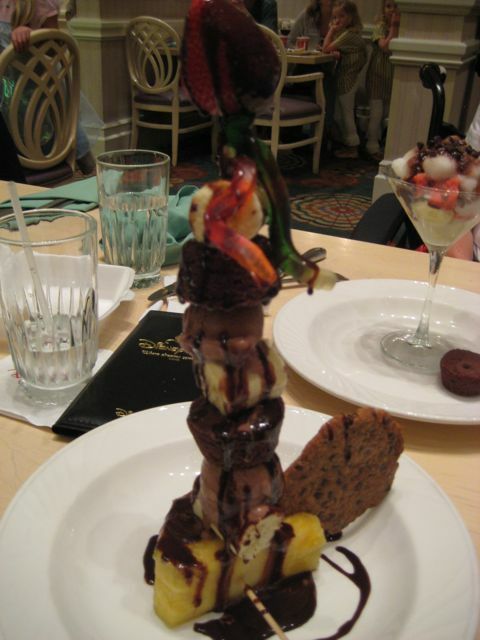 We had this last year and talked about it for a whole year until we could eat it again. And, just like last year, it totally didn’t disappoint. This soup is amazing. Get it! You won’t be disappointed. Unless you hate tomatoes. Then don’t get it! We also got the bread service. 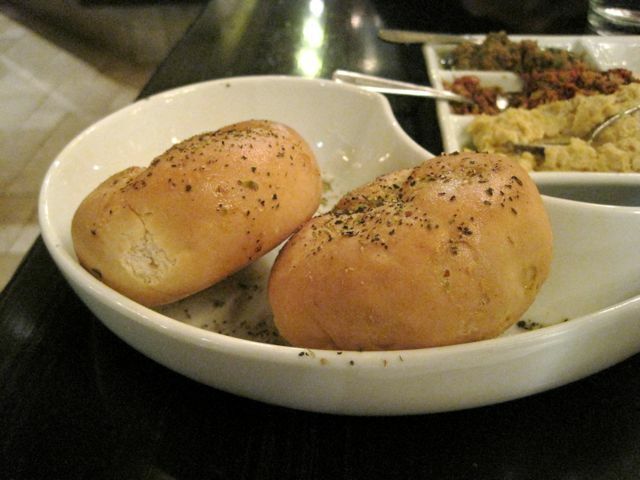 Last year the only difference (other than the accompaniments that we chose) was that there were Ener-G rolls as well. This year, we could only have the papadum (made from lentils, so mom limited it here). As always, it was delicious. There were eight accompaniments, but only five of them were dairy-free (and, therefore, vegan, though we are both dairy-free anyway). 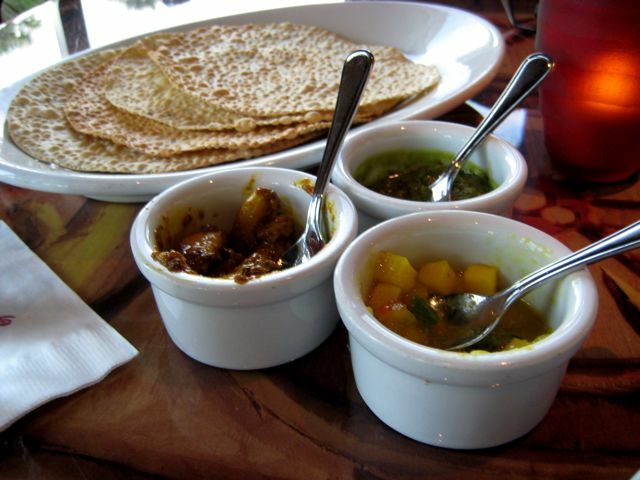 We chose the mango chutney, coriander chutney, and garlic-ginger pickle. They were all really good, and very different, but I loved the coriander chutney (heaven!) and Mom was partial to the garlic. There were lots of whole cloves of garlic in it, very raw, so just keep that in mind. Good, but stinky. 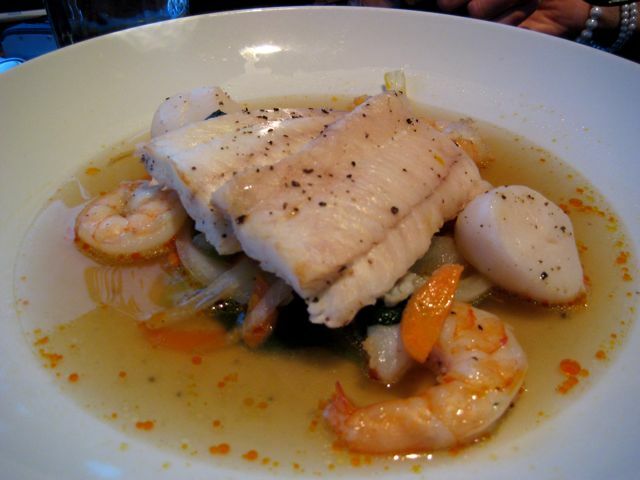 For our main courses, Mom did exactly what she did last year: the Sustainable Fish with shrimp, scallops, vegetables in a light curry broth. The fish was flounder and the chef was talking it up, which helped her with the decision. A lot of the meat-based dishes had dairy in the marinade (IE yogurt in the tandoori), which is what she would have opted for. Many of the others could be modified, but Chef Bob basically said that a lot of the flavor would go with those specific modifications. Flounder it was! Tender, fall apart, best scallops, she said. Lots, too – my photos don’t do it justice. And… just like last year, my options were pretty much the same. They have a vegetarian sampler, which has a choice of four different dishes (unfortunately, I can’t seem to find a menu online to see what they are), and basmati rice. There is also a five-grain pilaf (not gluten-free) as the option. I got Stewed Spinach and Cauliflower, Onions, Tomatoes and Mint. I could have eaten that spinach allllll day. It was so good. The cauliflower was good, too, but too spicy for me. And I got it last year! Next time I am bringing a piece of paper to note details like this (IE spinach = amazing). Excellent meal, very consistent, but if they don’t change their menu next year, Mom and I figured we might just come here for lunch one day for the amazing soup and yummy pappadum. 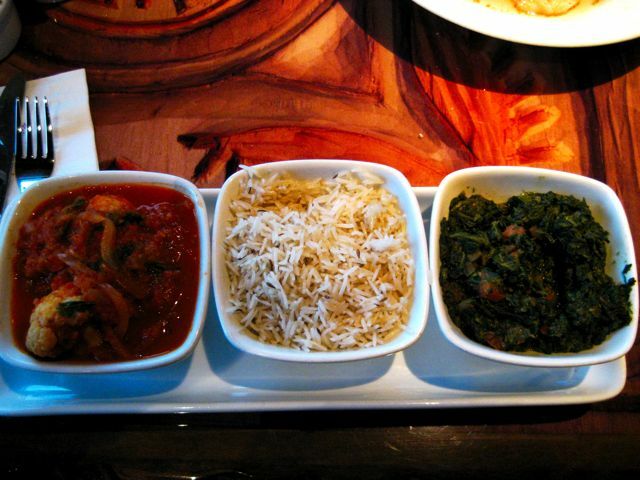 Check out my review last year for Sanaa (very consistent, not many changes). Post-race, my stomach was killing me (thanks faulty intestines!) so a full lunch wasn’t anything I was really dreaming about. I had done my research and read that I could get a safe sundae or version of one at Beaches and Cream. And that was all I wanted. Before I get to that, I’ll note that we had Chef Robert and our server was Dolores, both of whom which were AMAZING. Dolores was especially good, considering we had a billion questions, substitutions, and trouble with the wheelchair. Plus, there is no bathroom in there, so maneuvering with the wheelchair was difficult, too. Just something to keep in mind. 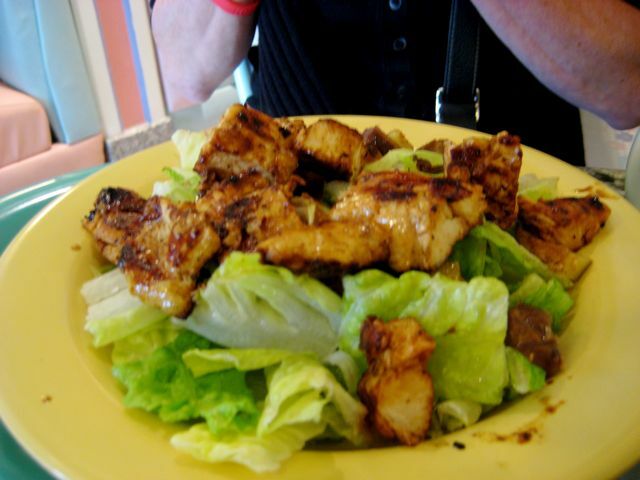 Mom ended up ordering the Grilled Chicken Salad, which basically had to end up being grilled chicken on romaine. She said, hands down, best grilled chicken she’s ever had. Tastes like it was fresh from the barbecue, she said. They had a choice of chocolate Tofutti (which I don’t like because of the hydrogenated ingredients), and vanilla Rice Dream (unlike the nondairy milk, the ice cream is safe). I chose the vanilla (clearly), and asked if I could get a pseudo-banana split. Not all of the components were safe, but the best ones were: fresh bananas and their peanut butter sauce. 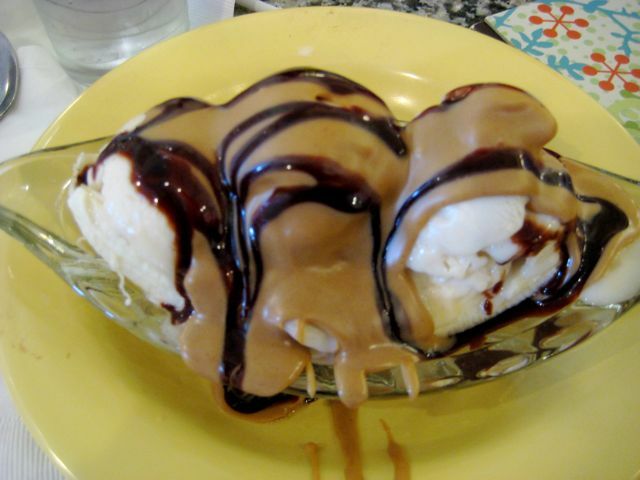 The peanut butter sauce, which is necessary to note for peanut butter lovers, is just melty, warm peanut butter. That’s it. And it was so good. They topped it with Hershey’s syrup, which I learned isn’t good at all (just tastes like sugary drizzle, not chocolate at all!). The only other options that were safe were pineapple (my only hated food), and sprinkles (which I’m not really a fan of. This was amazing. And definitely on the agenda for next year. Oh, how I love you, Beaches and Cream. That night, we didn’t have a reservation because we really weren’t sure how I would be feeling after the race. I knew that I would be hungry, but we weren’t going to head to the park, and my stomach was really doing a number on me that day. We headed to Downtown Disney because the weather was poor, and decided to see a movie, which we had sort of planned in advance if the weather wasn’t nice for an evening. I mentioned I wouldn’t mind onion rings like last year, so on the way to the theatre, we thought we would stop in Raglan Road and ask about options, figuring they might have changed from year to year. The manager working was Danielle, and the chef was James. He came out and spoke to us, explained the many choices, and we decided it would be nice for a late dinner and made a reservation for later that night. (On a side note, we headed to T-Rex, just to see, and there were no options at all). I already knew I wanted onion rings, but there weren’t really other options on the menu other than a salad, and raw vegetables were not in the cards for me that day with the pain I was in. Chef James had said he would come out and talk to us but he never did — to his credit, it was quite busy — but I was a little nervous about that. Our server was very nice (Alicia), but sometimes that’s just not going to settle the mind in situations like this. Alicia came back and forth a few times with different options, and we decided on a vegetable medley of what they had in the back. Unfortunately, a lot of the veggies he said were going to be on it didn’t make it, and much of it was overcooked. It was okay, but not worth the cost. Even more, I started feeling symptomatic right away. 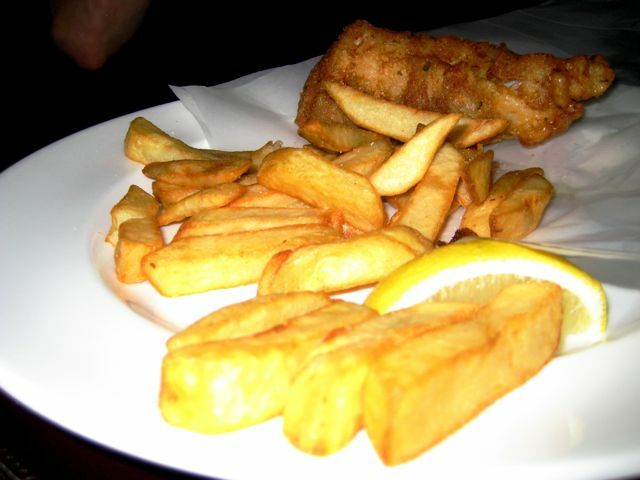 They do have a dedicated gluten-free fryer, so Mom got the fish and chips since she hadn’t had them since going on her diet. She said the fish was amazing, the fries were okay. 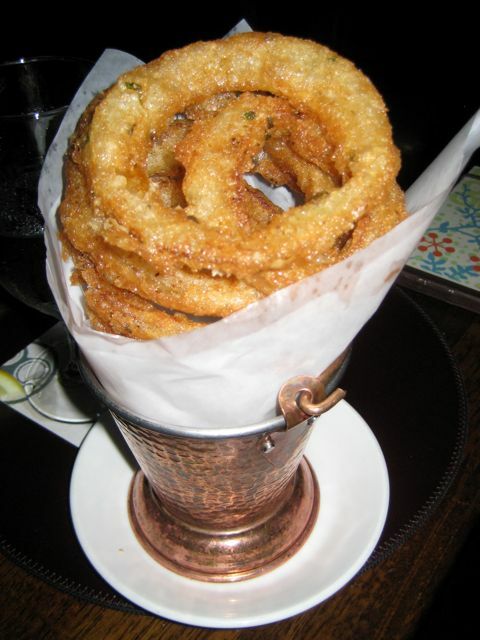 There was a saving grace, though: the onion rings were delicious. However, like I mentioned, I felt like I had potentially got some gluten here, so I am pretty certain I wouldn’t do it a third year in a row. A shame, but I had heard stories about issues with nut allergies here and finding nuts in “nut-free, allergy-safe” meals, so I am really just not sure. Check out my review last year for Raglan Road. Last year my post-race feast was a Boma breakfast buffet, and this year we thought we would keep the tradition alive. 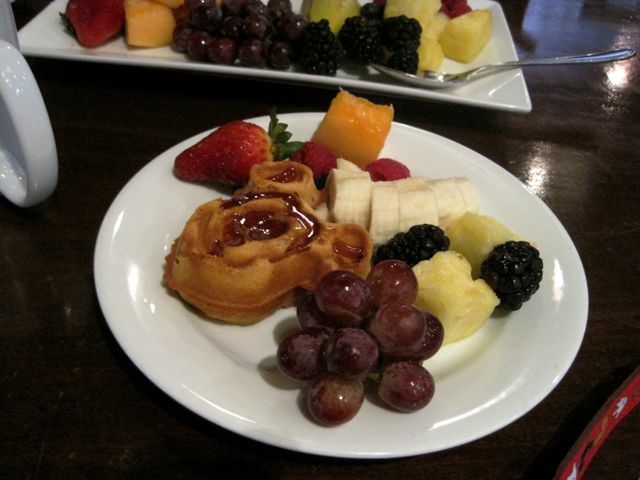 I love brunch, and was so glad that I woke up starvingand with a stomach that felt a little better from the night before. We headed early to the Animal Kingdom Lodge and walked around, talking to animal specialists at the savannah before our 10:45am reservation. When we got there, we were seated right away (it was dead because it was the last reservation), and our server might have been itching to get out of there, but, man, he was so crabby. Chris definitely needed a lesson in good ol’ fashioned manners. That, however, changed with Chef Jenny, coming out with a huge smile on her face and ready to answer all of our questions and concerns. I had spoken to the head chef on the phone and she had contacted Chef Jenny beforehand, so we pretty much knew what we were getting into. They carried Pacific Rice Milk (IE the safe one), and she was brimming with excitement to go off of the menu. 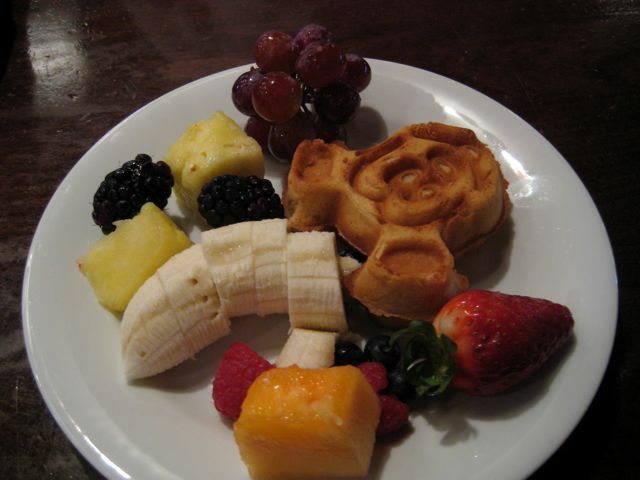 We had Mickey waffles (made with Namaste mix) and a fruit platter. That blob in the background is Earth Balance (not soy-free). 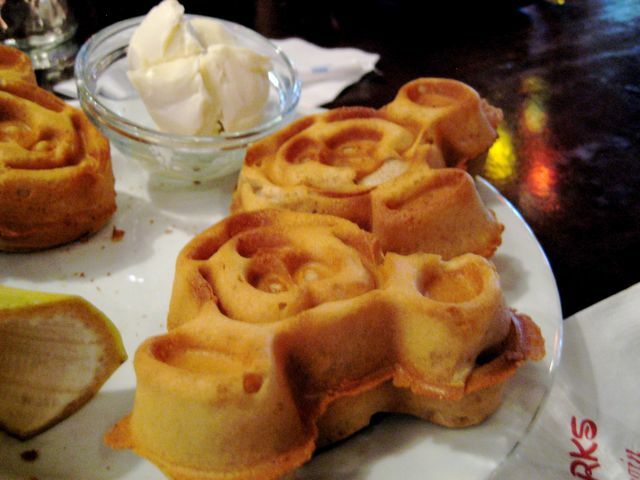 I am not sure if it is an American thing, but is butter/margarine with waffles customary? I just always went with the maple syrup. Speaking of which, we brought our own. Because pancake syrup is terrible and real, pure, awesome maple syrup is gold! We brought amber to make it even better. I don’t have photos of everything, but Mom also got a pile of all of the meats that were available. Even the breakfast sausage had no soy or gluten (or anything else, but those would be the general culprits). She made me a huge vegetable medley with lots of different veggies that they had on hand, including rutabaga, potatoes, corn, carrots, peppers, zucchini, and more. She also did up a plate of scrambled tofu, which I didn’t take a photo of. 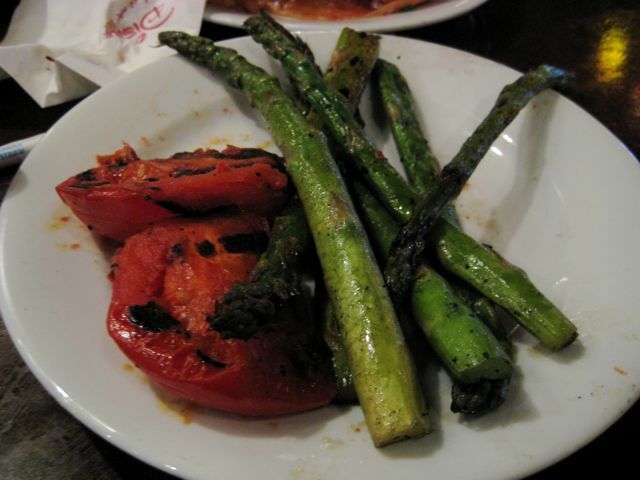 The slow-roasted tomatoes and asparagus from their wood fired oven were amazing (the tomatoes we had last year), and we had some chakalaka on the side that I loaded on everything. There isn’t much more to say here. 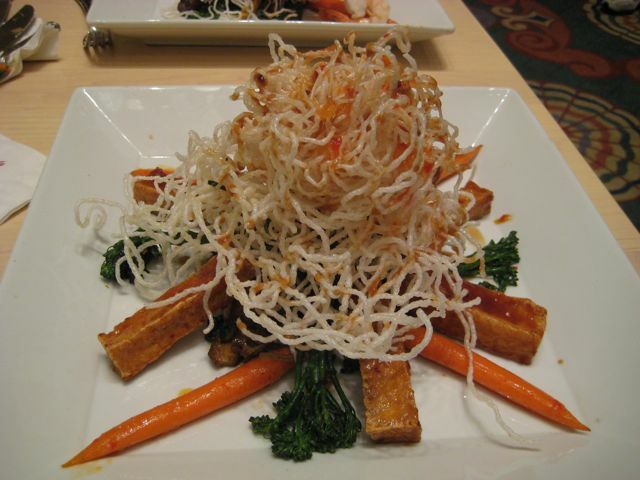 Boma is great with allergies, has a ton of options, and easy to eat at. The chef makes you everything in the back so you don’t have to worry about cross contamination, and the flavors are stellar. 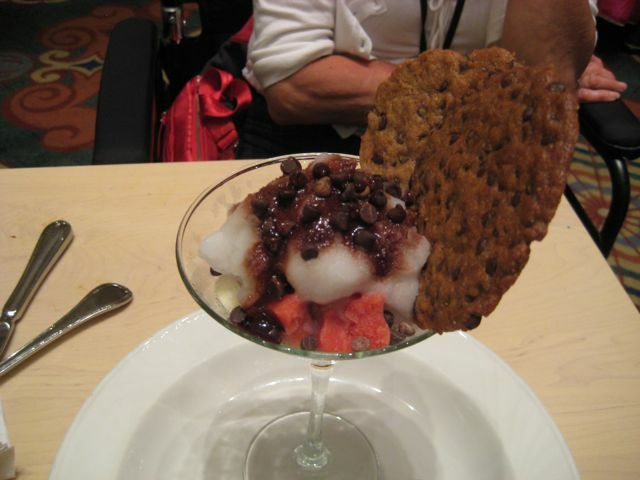 Check out my review last year for Boma (some changes, mostly because the chef was different). We do love Kouzzina, and knew already how awesome it was going to be based on a few things. First, we ate their last year, and Chef Dee was amazing. Second, we love Greek and Mediterranean food. And third, the chef that had called me was all too eager to have us come in. Just to add to this, when I spoke to them on the phone, he made some suggestions of things he would go out to specifically buy for us, so they were going to be well-stocked for our visits (we had a breakfast reservation later in the week). We knew we were in for a treat! Our server was Andrea, who is awesome to say the least, but when she brought over Chef George, we knew that we had a double whammy of a team working for us and it was going to be a great meal. He went over the menu with us and we discussed our options, but when it came to the combo of vegan and gluten-free, he asked if he could just come up with something. Of course, I said of course! I love when chefs go off-the-cuff, and was looking forward to what he was going to bring me. We started with the Kouzzina sample, obviously greatly modified to suit our needs. 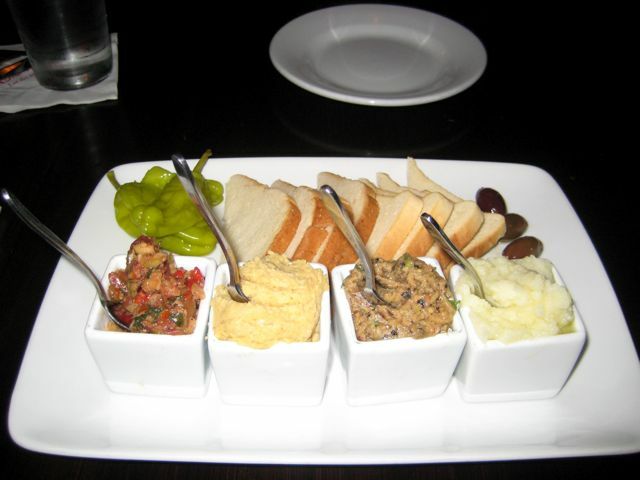 We had a trio of dips, including hummus, an olive spread, and an eggplant spread (not baba ghanouj, though). 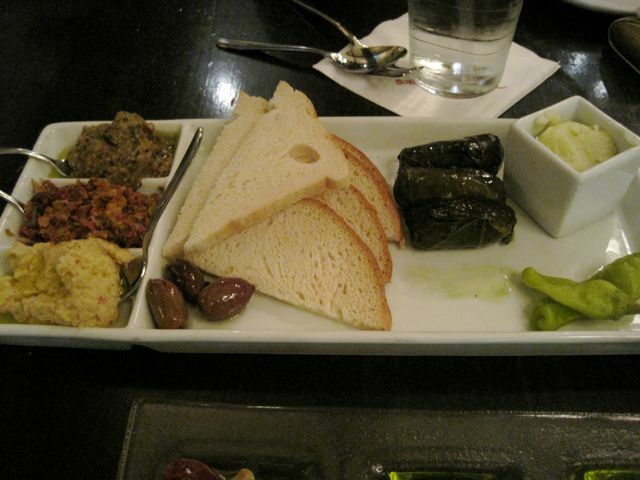 There was also skordailia, olives and garlic, dolmades, and pepperonicinis. The bread in the photo is toasted Ener-G bread, and the oils are their crete crista olive oil and kalamata oils for dipping in Ener-G rolls. Now, those Ener-G rolls were the BEST way I have ever had them. And I don’t even really like them! But they were the perfect avenue for those olive oils. He had toasted plus warmed them, brushed them with oil, and added herbs. So good. Following our appetizer, Mom had got her Fisherman’s Stew. All of it was naturally safe for her except for Ouzu butter, which he just left off because their dairy-free alternative was soy Earth Balance. This rocked her socks. Though I didn’t taste it (obviously), the smell was amazing. Really fresh, lots of aromatic herbs. 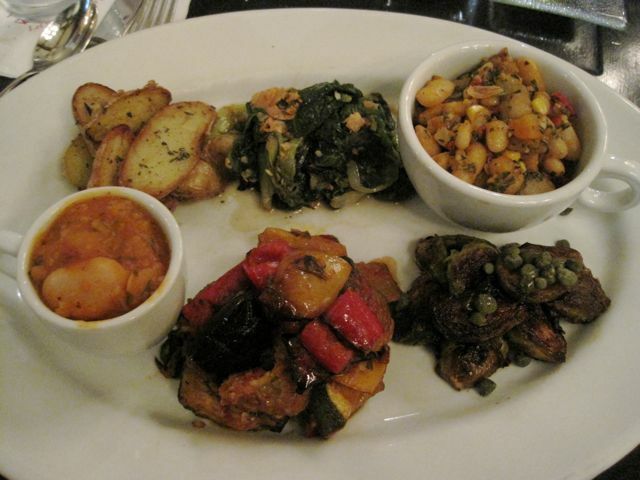 My sampler dish included, from top left, rosemary garlic olive oil potatoes, escarole with crispy garlic, a white bean, caramelized onion, parsley, basil mixture, gigantes beans, eggplant, zucchini and peppers, slow-cooked, similar to ratatouille or briam, and brussels sprouts caramelized with balsamic vinegar and capers. Each item was so good on its own, but they all went together in the most delicious combination. The potatoes were crisp on the outside and creamy on the inside. The garlic in the escarole was such a perfect level of toastiness (too much and it gets bitter). The white beans were so rich in fresh herbs that it reminded you of that summer freshness that we all look forward to. 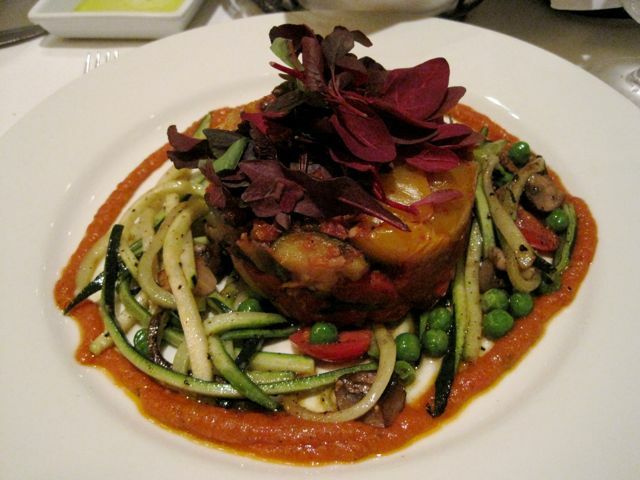 The gigante beans and vegetable dish had that homestyle flavor of Greek dishes we know and love. And the capers combined with the balsamic vinegar gave the right amount of salty acidity to the creaminess of the roasted brussels sprouts. Because Chef George knew we were coming, he had a dessert prepared for us. We obviously weren’t going to turn it down, and he brought this out for each of us. 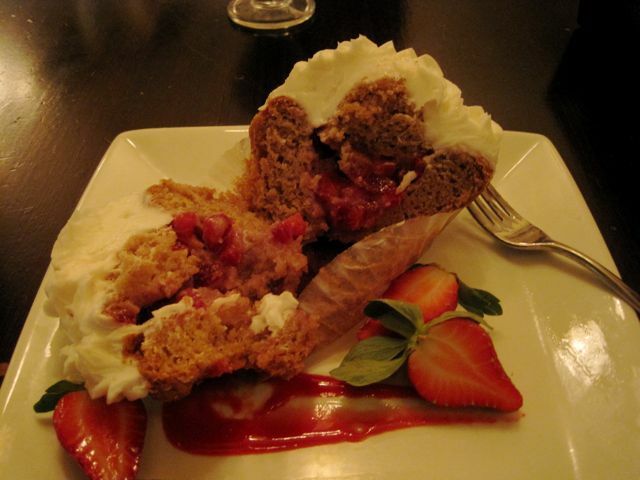 It was a modified strawberry shortcake: the cake was a (very chewy?) 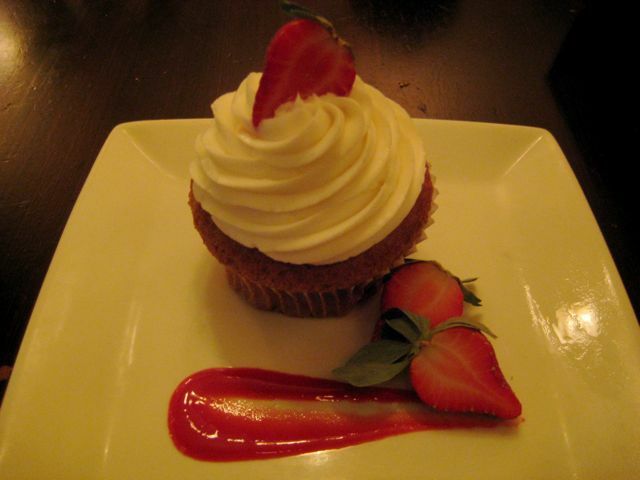 Namaste vanilla cake, with a strawberry/guava sorbet and fresh strawberries. 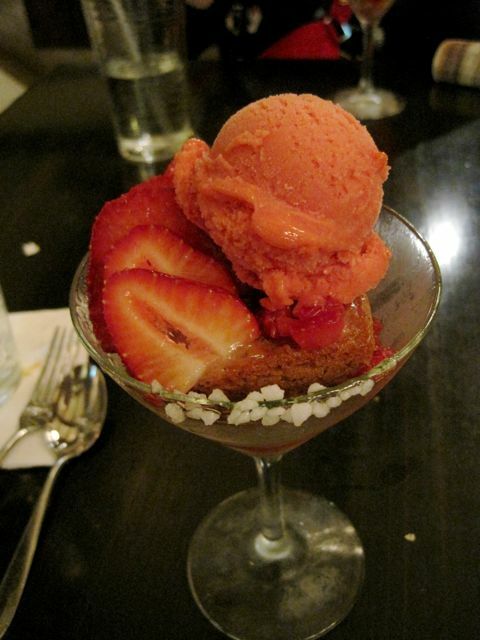 The cake itself wasn’t very good, but the sorbet was lovely–the guava added just that right amount of “difference” to elevate it from the ordinary. Chef George hung around throughout and after our meal and we had loads of awesome conversation. I was explaining to him all of the celiac and allergies, and we were talking about how Chef Brad (who was the chef for our Kouzzina breakfast later in the week) was “excited and planning for us as well, and has been trying to perfect vegan french toast”, which I had sort of requested in a whim. We also spoke about different chefs around the park, and I explained that I was frustrated that I hadn’t heard from Kona Cafe, which we had booked for the sole reason I could get sushi. Chef George said, “I could make you sushi”. I was sold pretty quickly, especially given all of the awesomeness we had already been subjected to at Kouzzina. It conveniently worked out that our Kona Cafe reservation was on a day that Chef George was going to be there, so we were all about it. We changed the reservation the second we got home! 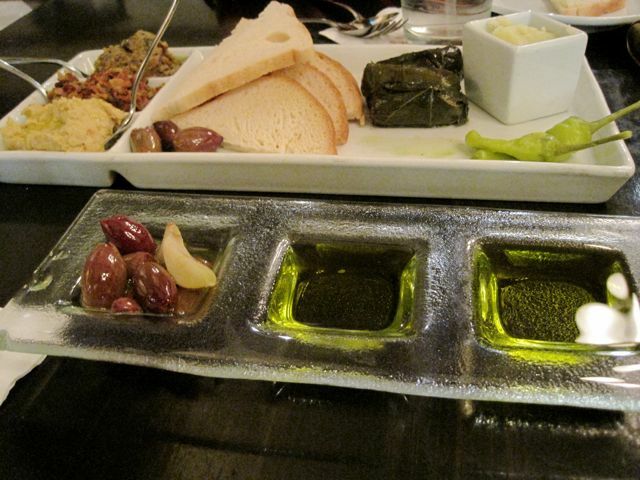 Check out my review last year for Kouzzina (so amazing). The reason I chose Citricos was because their menu had a vegan option already. And not only that, but it sounded great, too! When Chef Philip called me, he confirmed that it was vegan, naturally gluten-free, and loved by all, so I was pretty sold on it right away. After we had talked on the phone, I received a phone call the next day from the bakery that supplies desserts and baked goods (like the bread) for Citrcos and the other restaurants in the Grand Floridian. The woman was awesome, and she had seemed really apologetic that they couldn’t make us anything there because of cross contamination. She told me to go on Baby Cakes’ website and choose whatever we wanted for dessert, and that she was going to try to get us some cornbread for our bread to start. We didn’t really love the cupcakes or doughnuts last year, so I said that we really liked the loaves. She continued to make suggestions and I just said, “really, anything is fine!” but mentioning that neither of us do gluten-free oats. When we got there, Chef Philip came out to speak with both of us. He was friendly and attentive, and told us we had plenty to choose from. 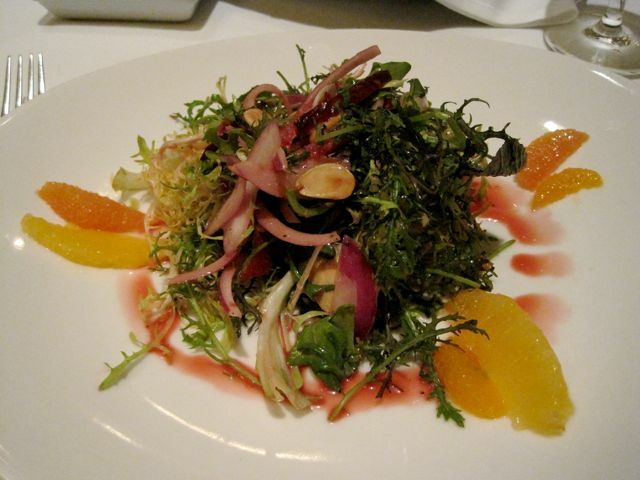 We both started with the citrus salad, which had “assorted seasonal citrus”, shaved red onion, mint and medjool dates, marcona almonds, and a blood orange vinaigrette. Maybe it is because we are subject to non-local citrus, but this was amazing! I would order this again in a heart beat. The oranges and grapefruit were so sweet, the dates delivered a pop of sudden richness, and the marcona almonds added the right amount of crunch. 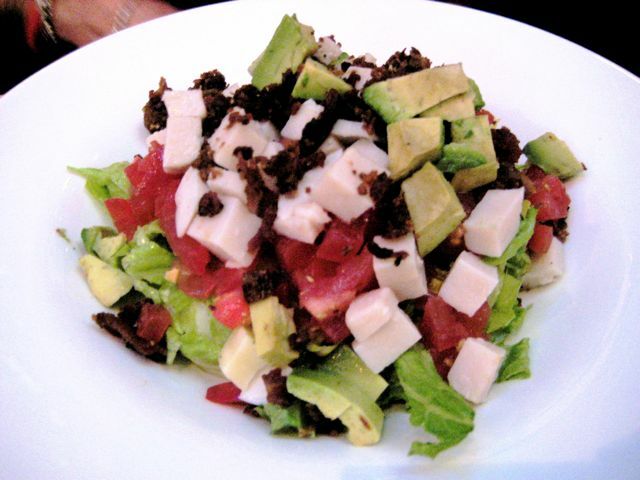 Though I am usually not a salad dressing fan, I loved the vinaigrette, too. We both ordered one of these. True to their word, there was a batch of Baby Cakes’ cornbread all warmed up for us, and some Ener-G rolls, too. But the rolls were cold, and if you’ve ever eaten one, you know that is less than ideal… I don’t think that they made it past the basket. 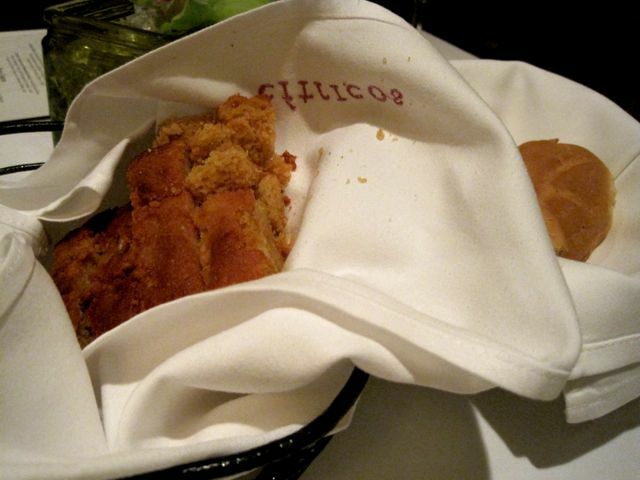 The cornbread was tender and delicious, though really sweet (like a dessert bread). A nice change, and because I love cornbread anyway, it was more than welcome. Mom ordered the pan roasted chicken breast. It was on the bone and was extremely moist. Though she said this many times on the trip, she said this was the best prepared roast chicken she has ever eaten in her life. You could tell from seeing it, how easily it came off the bone and how moist it was. It came with a piquillo pepper polenta cake, but it wasn’t safe (not sure if that was gluten and dairy, or just one or the other; I remember it was one of them), so it was on roasted potatoes, instead. 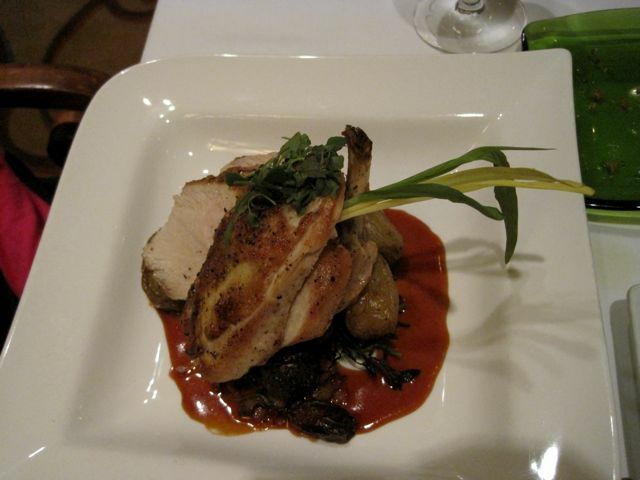 It also came with sauteed spinach and dressed up with an apple cider-infused chicken jus. I had the option that was already gluten-free and vegan: seared tofu zucchini and eggplant ratatouille, roasted mushrooms, lentils and sundried tomato puree. Let’s be honest: a lot of chefs have no idea what the heck to do with vegans, let alone tofu. But Chef Philip got it right. It was just the right texture with a bit of chew, loaded with that ratatouille flavor, perfectly seasoned and, well, just so good. The zucchini was spiralized, and the lentils had that perfect consistency where they were cooked just right: a little tender, a little firm. Oh, this was SO good. Their dessert that they brought us was a plate (each!) 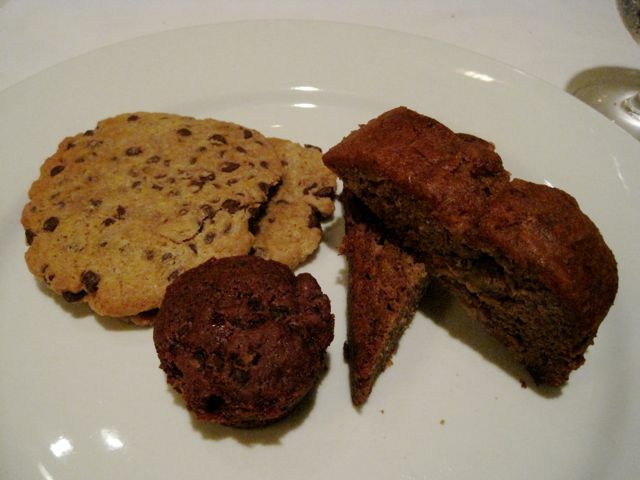 of things from Baby Cakes: a slice of the banana bread, a brownie, and two chocolate chip cookies. The banana bread was super moist and very cake-like, the brownie was a bit dry but had good flavor, and the cookies were a huge improvement from last year: a little chewy with crisp edges. This might have been due in part to that they were stored in the freezer at the bakery waiting for us, but whatever the reason, they were a good ending. Not much to report here: I basically just came here for a milkshake. It took forever to talk to the chef (which was odd, it was around 2pm), but that was fine. However, I might have got him at a bit of a mood, and there was a bit of a language barrier. I asked him about the rice milk, since Rice Dream isn’t safe, and neither is Kikkoman. I wanted to be sure they were using Pacific Rice Milk, and nothing else. Long story short, it was fine, and I got a vanilla milkshake with Rice Dream Vanilla Ice Cream and Pacific Rice Milk. But… this was not done without a lecture from the chef for needing to understand that even if there was gluten in either of those milks, I wouldn’t have gotten sick because they only use a splash. Check out my review last year for 50s Prime Time Cafe. I chose to eat at The Wave on a whim. I had heard mixed reviews, and we wanted to choose a spot that was a little cheaper, since we obviously were having plenty of pricy dinners! I am going to tell you I’m sorry that these photos are terrible. The lighting was really odd in there – super bright but dim at the same time. I know, that doesn’t even make sense. Our server was Cheryl (and really nice) and our chef was Chef Dylan. He seemed flustered but was really kind, and there were a lot of families around so he was probably pretty busy. He went over the menu with us and we decided to order the same thing. 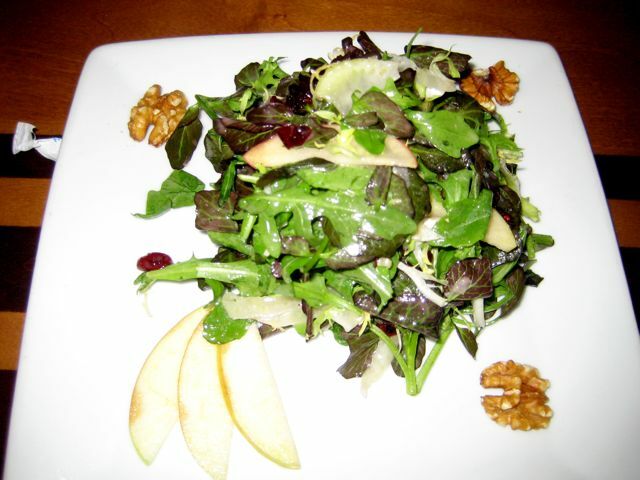 We both started with the Fall Harvest Salad, which had heirloom apples, walnuts, and an ice wine vinaigrette. The walnuts were actually supposed to be candied but those either weren’t safe or he wasn’t sure they were safe, so he opted for (three) raw ones instead. There were about three slices of apple, too, but though the portion was mediore, the flavor was amazing. 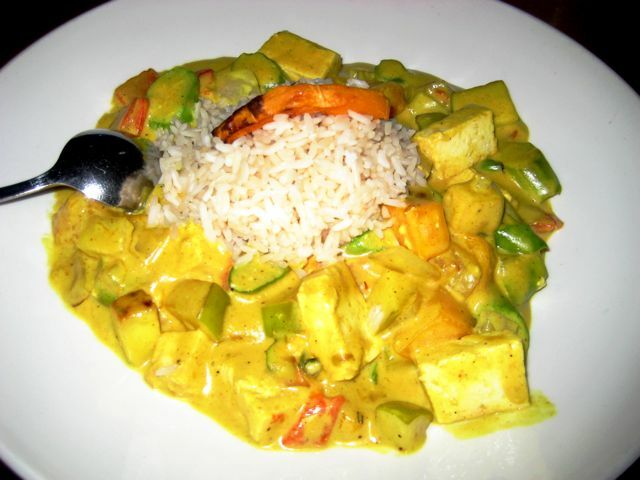 He didn’t have to modify the curry vegetable stew off of the menu and we both got that. I was itching for some protein and asked if he had tofu hanging around, which he did! He put it in my stew (not Mom’s, obviously), and a ton of it! There must have been half a brick. The stew was really delicious, though extremely rich. 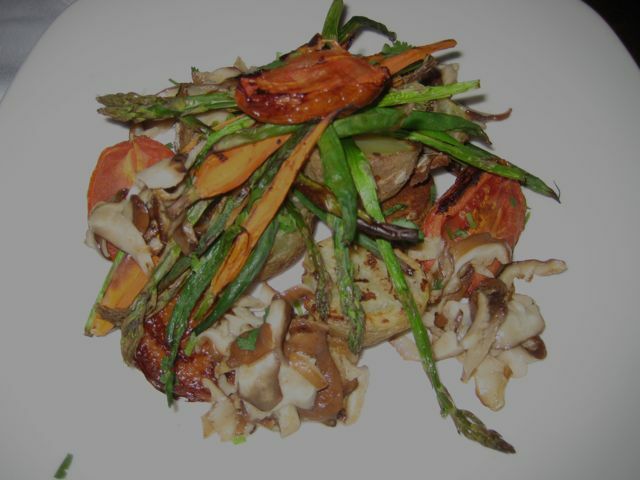 It had butternut square, asparagus, heirloom apples, carrots, and other vegetables, and all served on rice. We couldn’t get the jade rice because it was mixed with wheat berries, so it was served on regular short grain white rice. Usually I’m not a huge fan of “regular” white rice (I really like basmati and jasmine), but this was steamed exactly the way it should be, and soaked up all of the sauce (which there was tons of). The curry isn’t spicy at all, and just a bit sweet (from the apples), and extremely rich. It was good! I did feel a little weird during this dinner but am not sure if I got glutened or if it was from earlier in the day, because I was feeling symptomatic then. To make a reservation for the Hoop Dee Doo, I got on the phone and called to basically see what the options were, how wheelchair friendly it was, and what it was all about. We weren’t sold on if we were going to like the show, but it was about the same cost as some of our dinners and after hearing what we could order, we decided that it would be a fun night out. The woman I spoke to on the phone at the Hoop Dee Doo was guiding me through the options. 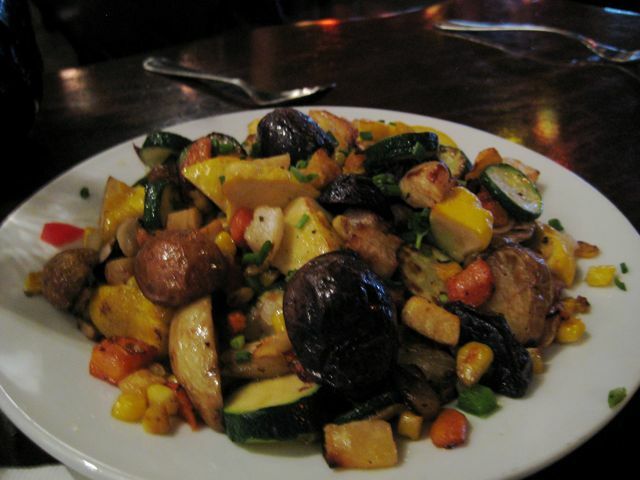 For the vegan/vegetarian alternative, they have either a grilled vegetable platter or a pasta dish. 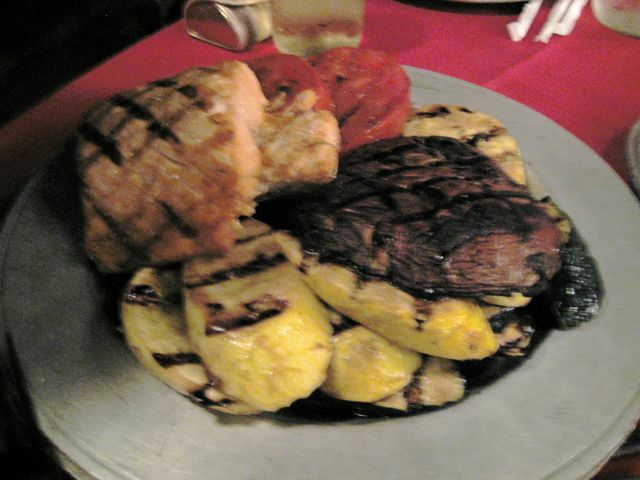 I was definitely keen on the grilled veggies! They already offered a veg baked beans, too, which were naturally gluten-free. For mom, her choices included the same, or salmon, so she opted for that. 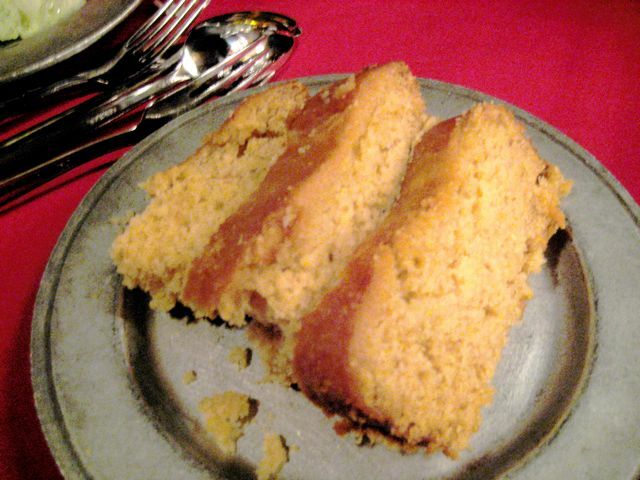 We were okay for the salad, a fruit dish for dessert (or ice cream or sorbet, but we chose the fruit), and I threw out the idea about Baby Cakes’ cornbread. I normally wouldn’t have asked, given that was something that the bakery did special for us at those other restaurants, but I thought I would throw it out there because cornbread is on their regular menu. She said that she would definitely try! We had the salad to start. 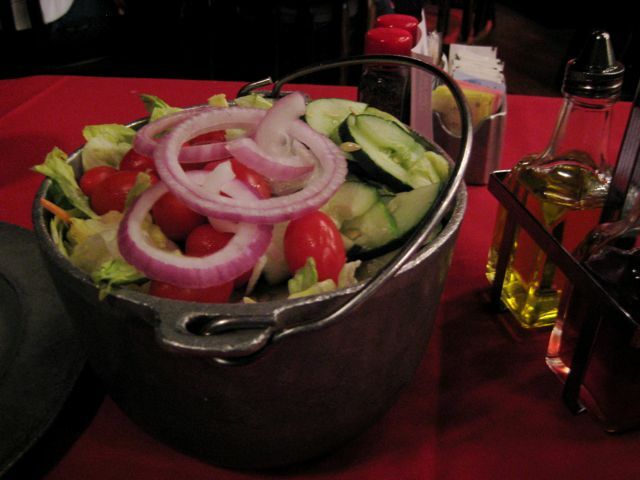 Salads are already on the table and ready to go, so be sure that you ask for a new batch sans dressing. I wasn’t sure if it was gluten-free/dairy-free/soy-free/et cetera or not, but they didn’t know, either. Then some Baby Cakes’ cornbread. Cold but still moist! This was Mom’s plate, which doesn’t include the huge baked potato that was brought out on another plate. Though that doesn’t look very big, to put it into context there were two pieces of salmon (probably about 4.5oz each? ), and that portabello mushroom on the right was huge. Everything was grilled. This was my plate, all of the same stuff, but no salmon. I don’t think this looks like very much, but honestly, it was loaded in there. If you’ve ever been here, the plates are huge! An there were more veggies under all of that. Spinach, zucchini (which you can’t see), summer squash, the potato, more than just that tomato. Plus, a huge bucket of baked beans which I didn’t photograph. Alcohol is included here, so Mom had a glass of white wine and I had my first gluten-free beer as well as my first drink since being gluten-free for seven years. It was a Redbridge beer and I was so disappointed. Is there any gluten-free beer that tastes good? I couldn’t even finish it. 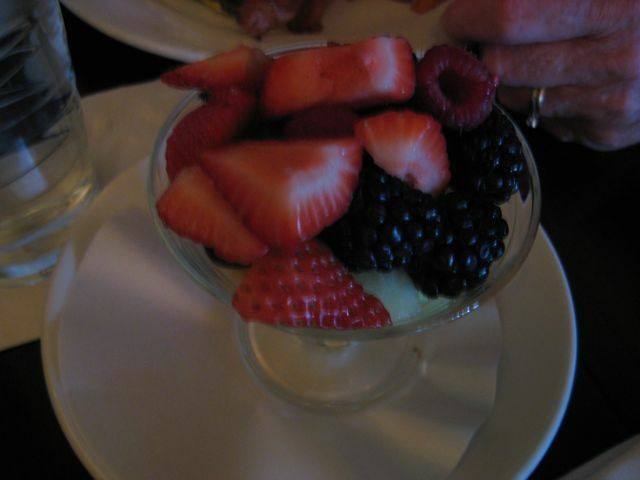 This was our fruit dessert but we were stuffed. 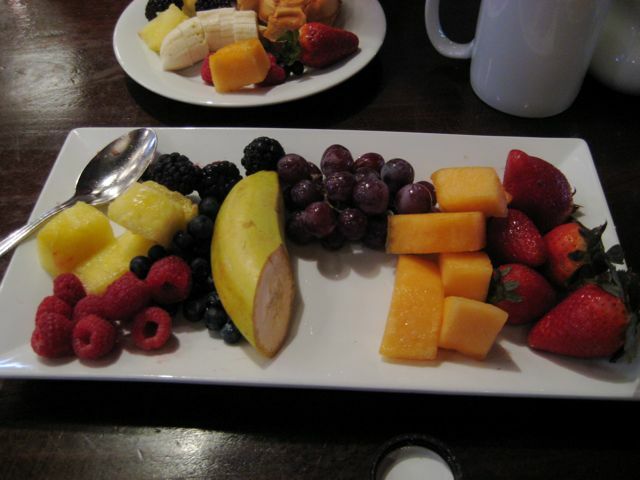 I only ate the strawberries, which tasted fresh and sweet. And as for the show? I would go back here for the food, but the show itself wasn’t anything to write home about. I’m a little surprised at how much people love it, but maybe it just wasn’t our thing. It seemed a little rushed? I did think parts were funny and, as I said, I would come back, but Mom suggested something else next year (like Cirque du Soleil). Check out the menu here (though it won’t be very helpful considering it contains no allergy or vegan items). 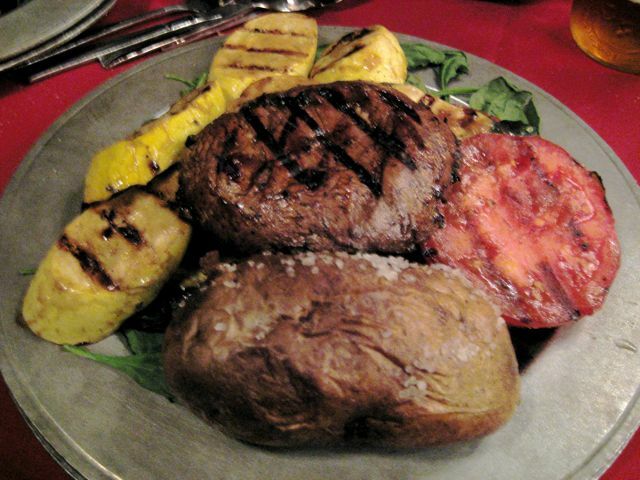 Visiting Canada wasn’t necessarily on our must-dos, but a good steak for Mom was. That was pretty much her only request for restaurants (other than ones we knew we wanted from last year), so I Googled “best steak in Disney” and read how awesome Le Cellier would be for her. The Chef did give me a call and ensure me that they “always have lots of gourmet[?] vegetables” and I was pretty convinced that since they were a signature restaurant, they would be able to come up with something easily. That being said, when we got there, everyone was super pleasant. Why? Canada, of course! Our server, Dani, was from Toronto, and when another person who works there realized he had locals, he headed over (and we played the “oh, you must know _____” when we realized where each other went to school). Fun! Is that annoying to people? I don’t know. It was neat seeing someone local out of context. Chef Sergio came out with a bit of uncertainty on his face, hearing he had a vegan at the table. There were a few choices for appetizers, basically leaving off cheese for a couple of the salads, but not much past that. We did have a few options to start, and narrowed it down between the heirloom tomato salad and the beet salad. They both sounded good, although I don’t usually love beets (I don’t dislike them, I just don’t really go out of my way to buy them), but for some reason, the salad sounded like it was calling my name. I asked Chef Sergio for his recommendation and he said the beets, especially because the cheese that was on there was sort of an afterthought, and not integral to the dish (whereas in the tomato salad, the bleu cheese played a main role). So we went with the beets. The bet salad had chioggia, golden, and baby beets, with mache and pistachios. It completely didn’t disappoint. 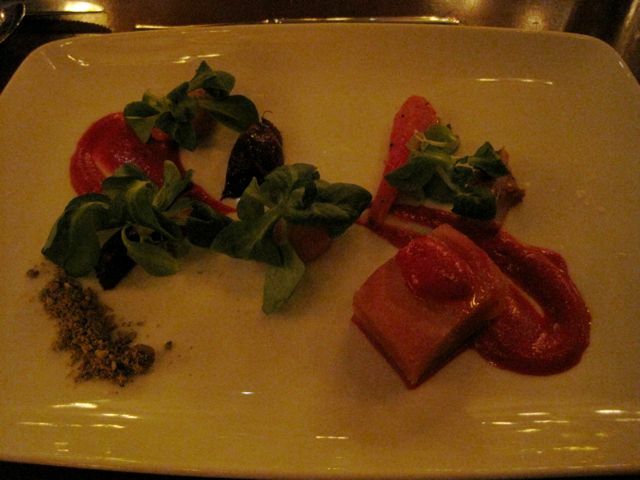 The presentation, despite what the camera shows, was beautiful, and the beets were so perfectly seasoned. They tasted marinated, were crisp tender, and whatever the dressing was, well, it was fabulous (I think it was a beet puree). The pistachios were roasted and salted, which was just the right contrast. We both loved it. In fact, it made me love beets. So Chef Sergio had no protein options for me, but he did have a few veggies hanging around in the back. 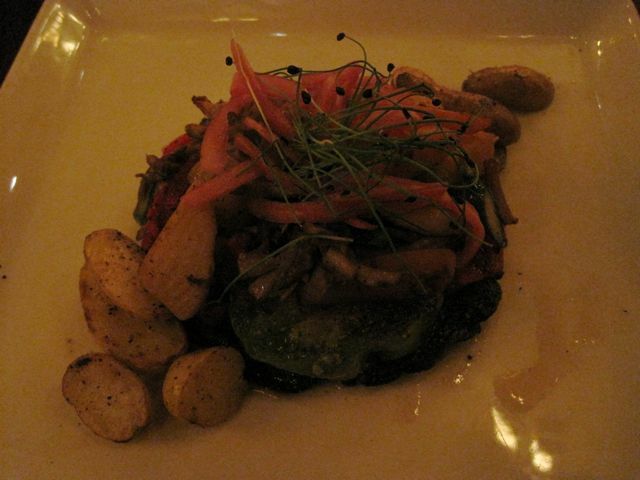 My dish was a portabello mushroom with roasted potatoes, heirloom tomato, and some carrots and zucchini. It was really small, and I don’t mind fine dining and small dishes, so I was glad I got an appetizer. He did load it (really, really load it) with fresh cracked pepper, which was a little rough on my stomach. The vegetables were cooked perfectly, though, which made it pleasant enough. After all, I was only a sidekick in this meal – this was Mom’s! She ended up ordering the 16 ounce bone-in rib eye with mashed potatoes. 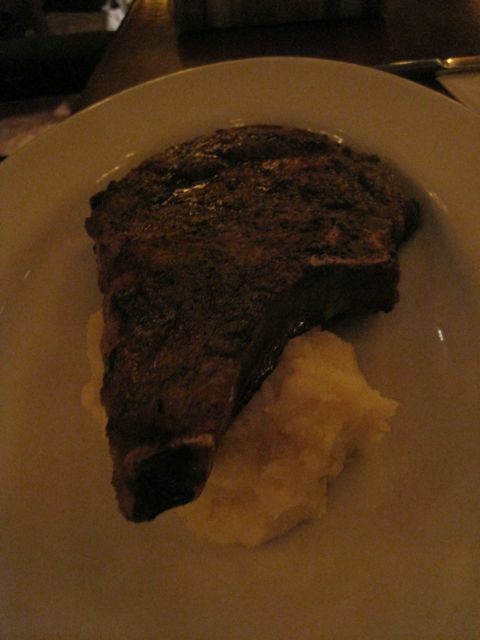 It was huge (16 ounces, after all), but since rib eye is a fatty cut, she ate the whole thing with ease. They cooked it to her liking, double checking of how she wanted it to appear on the inside, and her olive oil garlic potatoes, she said, were amazing. Success! 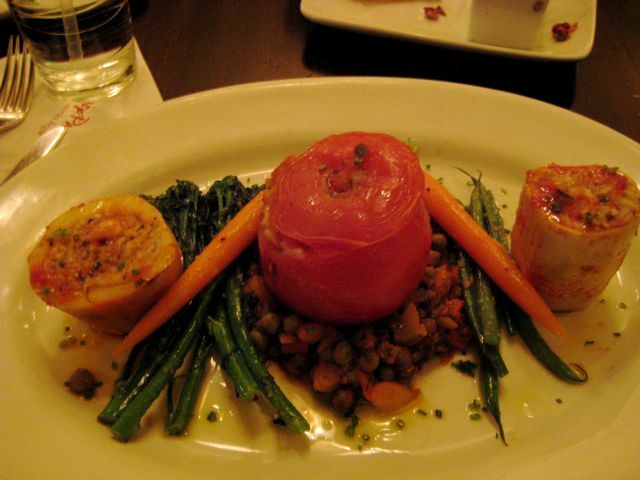 Now, I am not sure if a lot of veg folks are heading to Le Cellier, but when I just snagged their menu for this update, I see what looks like a delicious vegan (or vegetarian) dish on their menu, and could be gluten-free: Quinoa Potato Cake with Royale Trumpet Mushrooms, Baby Beets, and Wilted Ramps. Ugh, that sounds awesome! If anyone goes and gets that, report back! We had spoken in excess to the chefs and already had a feeling of what was up their sleeves. Chef Brad was taking care of us this morning, and we were totally excited because he was just like Chef George. We had told him on the phone that doing a vegan French toast would be awesome, and he used the Ener-G bread that Kouzzina had gotten in for us. When he brought it over he apologized: he said he mastered the vegan French toast but was having trouble with the bread itself (because it is so flimsy). He said he was embarrassed to serve it to us, but asked if we still wanted it. Of course we did! And you know, chefs are always their own toughest critic, and for someone who hasn’t had french toast in seven years, I thought it was fine! It tasted like French toast on crappy bread. But definitely like French toast. Again, we used our awesome amber syrup. A few minutes later, he came out with a whack of Mickey waffles, again, apologizing for the French toast and saying that he gave us these to make up for it. I didn’t take a photograph but they were delicious, as always. They used the Bob’s Red Mill mix. The French toast came with a side and Mom ordered bacon, and, again, Chef Brad felt bad there were no other options and brought me fresh berries, which was great. We both ordered the sweet potato hash on the side, which was amazing. 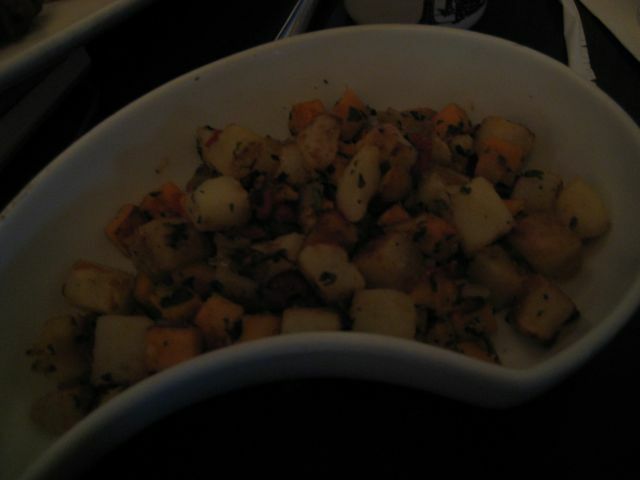 Two kinds of potatoes, lots of Mediterranean herbs, tender, and crispy and a little smoky. 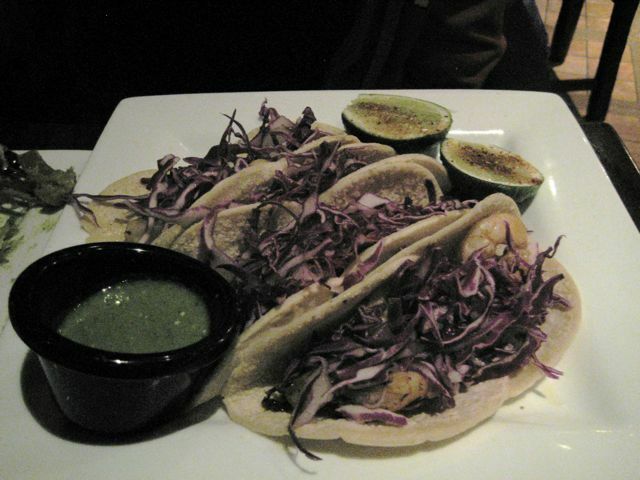 Don’t forget to read my dinner reviews of here, too! We knew this was on tap for this year, especially considering how much we loved it last year. I purposely booked our reservation at 8:30pm and hoped that we would score a seat near the window to watch Illuminations at 9pm. Not only did we get a seat beside the window, we had a perfect clear view! It was awesome. The server, whose name I forgot to write down, was very good. Just so darn nice! Chef Manuel did come out, and they were helpful. It was pretty much the same scenario as last year with their efficiency and kindness. Instead of chips and salsa to start, we asked for corn tortillas since Mom can’t have the chips (they have soy oil). We also ordered some guacamole to go with them. Mom ordered the Tacos de Camarnones, which she got last year. They had grilled shrimp (usually fried but in soy oil), chipotle-lime aioli, lots of cabbage, lime, and salsa verde, all with corn tortillas. That looks small but they were loaded. 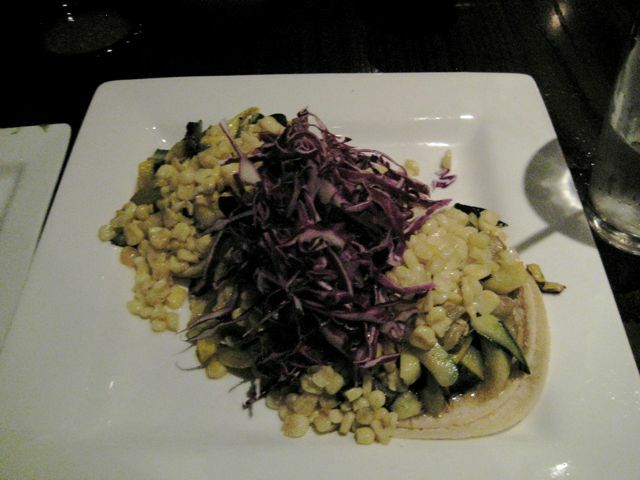 I, too, had the same as last year: Tacos de Vegetales, which included grilled zucchini, roasted corn, queso fresco, all in corn tortillas, as well. Again, looked small but loaded! One difference was last year, the rice and beans weren’t safe or vegan. This year they were! 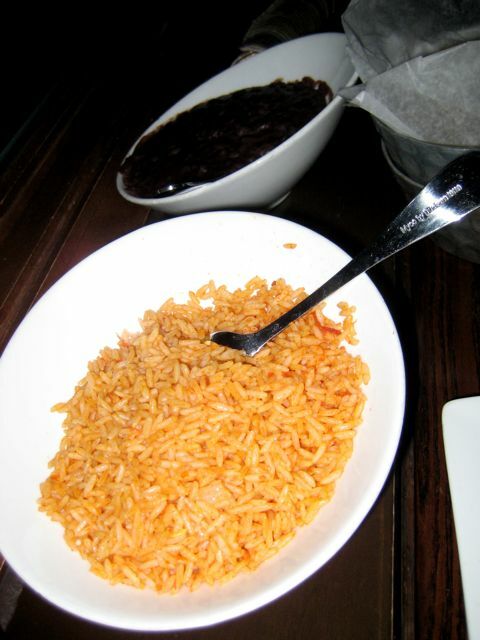 Those beans rock my world, and we ate through two bowls full. This is a great place to come if you love Mexican food, love lots of food for your money, and, well, just love food. Plenty of the menu is gluten-free, and they have a separate vegetarian menu (most of which is vegan). The server ended up staying with us, chatting for awhile about Mexico and his hometown, til about 11pm. It was a really fun night. This is such a great restaurant. 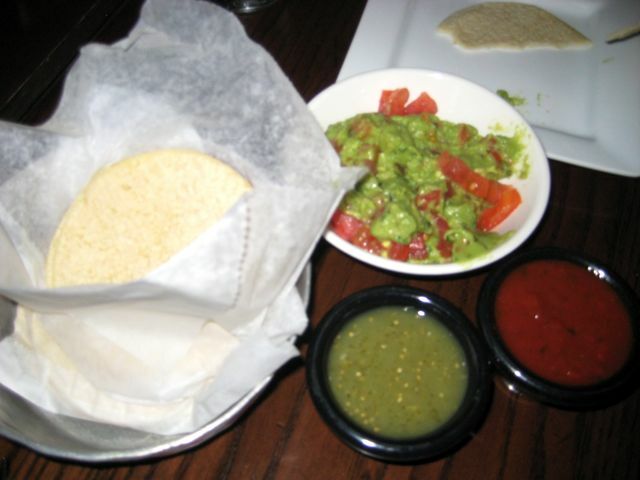 Check out my review last year for La Hacienda de San Angel (pretty much the same). We knew that the elusive Chef TJ was still at Park Fare given our phone calls and hunting around, so we opted for this character dinner with a feast in mind. Like at Citricos, they had some goodies for us for the end, but we also knew that Chef TJ would be delivering lots of delicious options throughout the meal. He came to our table with his friendly smile–if you’ve ever met him, you know the one–and told us we were taken care of. He is always in a hurry (or so it seems), but in a good way, because he wants to meet every persons’ needs in the place who has a special diet (and there were plenty… he was running from table to table). 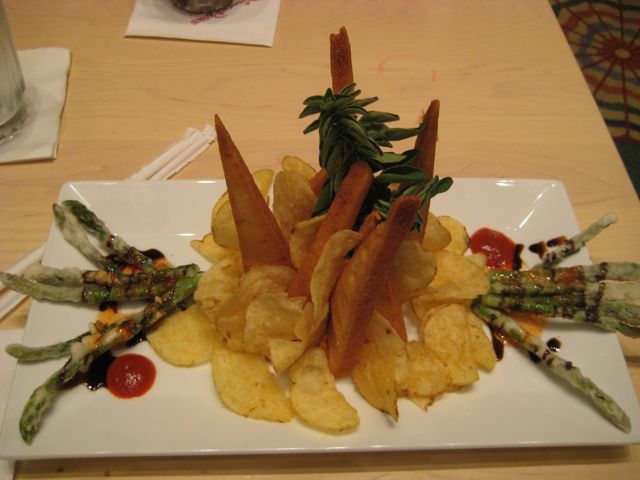 He started us off with this as an appetizer, which included potato chips, tempura asparagus, and deep fried Ener-G pizza crusts. There were hot and sweet sauces on the dish (those red and dark blobs), and it was all shoved inside roasted red pepper hummus. Everything was really good, though I mostly ate the hummus with a fork because of all of the richness of the fried foods (and my stomach can’t always handle it). 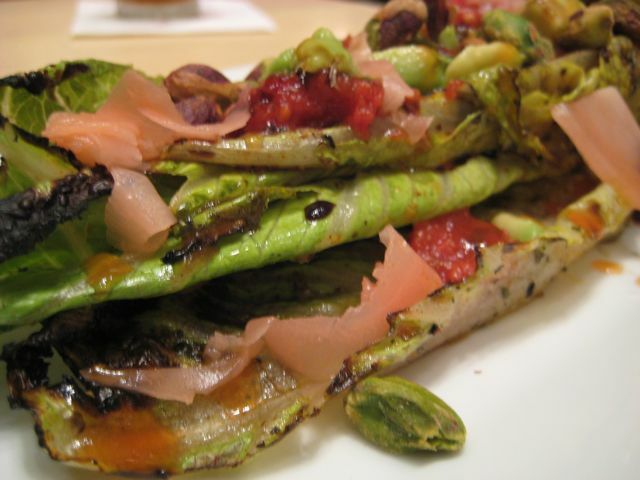 I loved the asparagus. 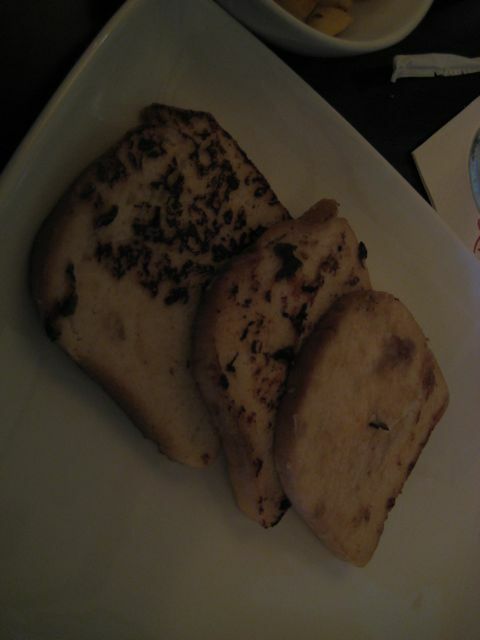 The crusts had soaked up tons of oil and had a really weird texture, almost spongy and crumbly all rolled into one. Anyway, Mom loved them and we pretty quickly polished it off. 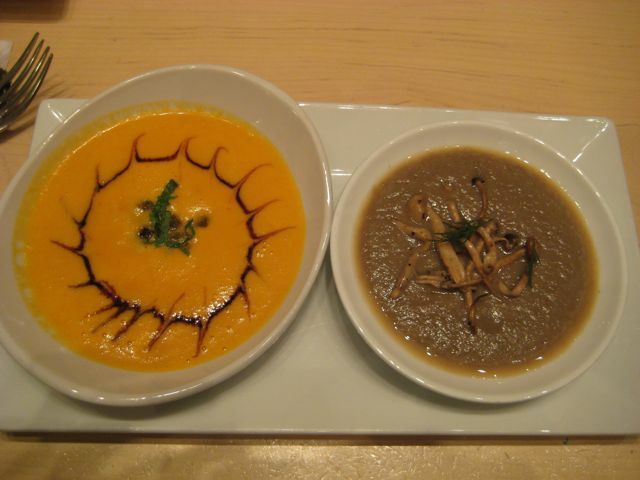 The next course was two soups. Despite the side, the bowls were actually really shallow, which was a great thing considering how much more food we knew we were getting. 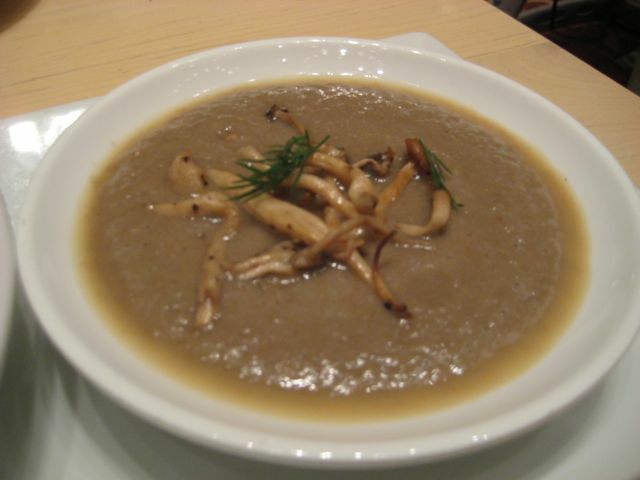 … the spicy mushroom soup. Because, man, was it spicy! It had a little fresh dill on it and its texture was so… light! I can’t think of a word to describe it, but it was almost foam-like in texture. We both loved both of these. I certainly can’t choose which was better because they were so different, though I tend to be partial to curry. Our third course was our salad course. 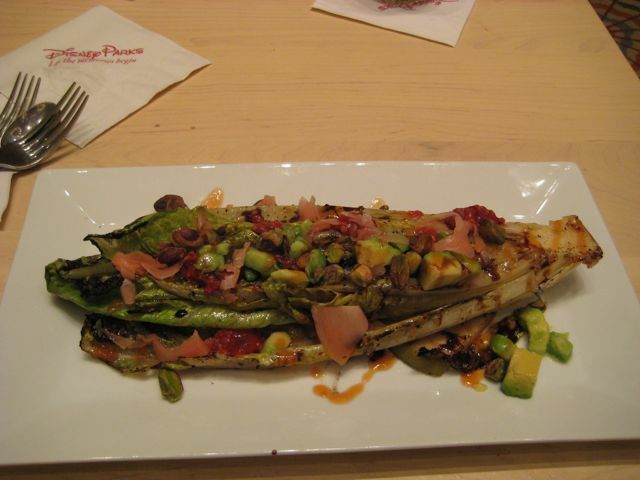 This was grilled romaine with avocado, ginger, pistachios, pickled ginger, spicy tomatoes, grilled pear, and a balsamic vinegar reduction. He left the pistachios off of Mom’s (I think he thought peanut-free meant nut-free), so I gave her a bunch of mine — the saltiness of them was lovely on the salad and I didn’t want her to miss out. Though you can’t see it, there was about 1/2 a huge pear in there, too. Just to put this into context of how much food we’ve had so far. We were already pretty full! 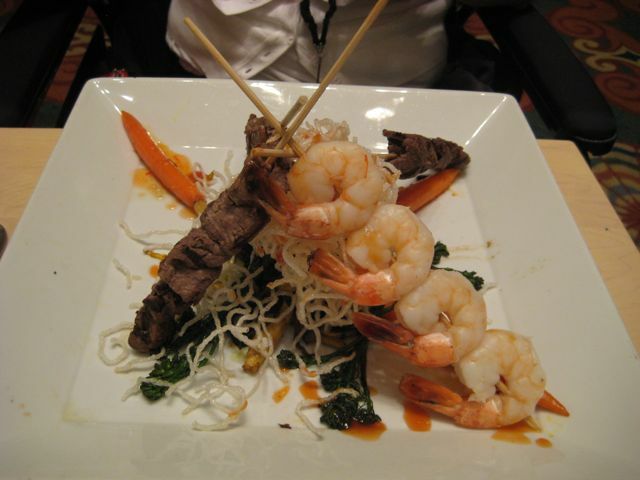 Course 4 was next, Mom’s main course, which was beef and shrimp skewers with carrots, broccolini, potatoes, mushrooms, and fried rice noodles in a sweet and spicy sauce (which wasn’t on her meat, just on the vegetables). Mine was exactly the same as last year. I loved it and it was well cooked but a little too sweet and fried for me. I would have loved to have had plain tofu and no sauce on the veggies. Just a really rich meal! It was certainly delicious, but I think if we go here next year I would have to tell him that. True to Chef TJ, he doctored up the Baby Cakes’ offerings. Mom’s dessert was the pina coloda mixture(! ), some mashed strawberry fruit bar (the frozen ones they sell in the parks), strawberries, banana, two chocolate chip cookies from Baby Cakes, chocolate chips and Hershey’s Syrup. She said it was really yummy. Mine was this tower, similar to what he usually does! That was chocolate Tofutti (which I didn’t eat, and was worried about cross contamination… is it for sure safe? ), Baby Cakes brownies and a chocolate chip cookie, bananas, and gummy worms. I didn’t eat the gummies because I wasn’t certain they were safe, either, so tried to eat around everything. I never normally would just eat around it, but I figured Chef TJ gives stuff to people all the time and they never get sick. I just tend to be really sensitive. I ate that in fear, to be honest! Check out my review last year for 1900 Park Fare (similar main dishes, completely different appetizers). Food allergies or not, I never eat in chains because they usually aren’t very good. Now with celiac and a dairy allergy in the mix, I never eat at them because I don’t trust them, even if they have a gluten-free menu. That being said, we had a $15 voucher for Planet Hollywood and figured it would be cheaper than eating at quick service, plus, since it was Disney, we were more trusting. There isn’t much to say here, other than it was freezing cold in there! The menu was really hard for a vegan (not surprising) but I just knew I wanted a salad anyway, so it wasn’t a big deal. I ordered a spinach salad that was supposed to have peaches, strawberries, walnuts, red onion, and a tomato balsamic vinaigrette. It usually came with chicken and bleu cheese. 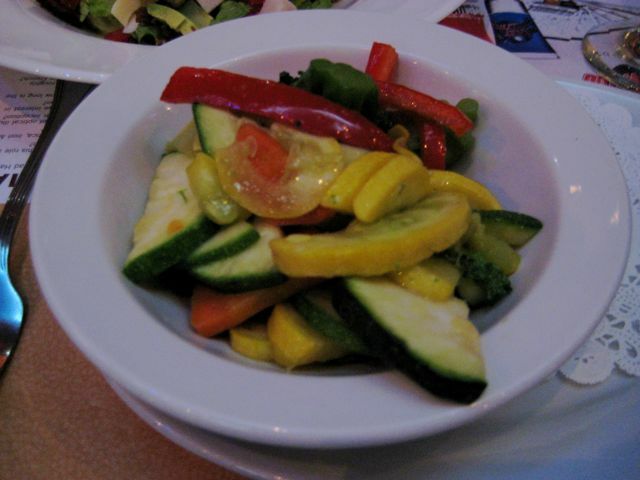 I also ordered a side of fresh sauteed vegetables. The chef told me the vinagrette was just tomatoes, basil, balsamic vinegar, and olive oil, so I opted to stick with it instead of just asking for lemon. Unfortunately, this is what I got: a pile of baby spinach with three CANNED(!) 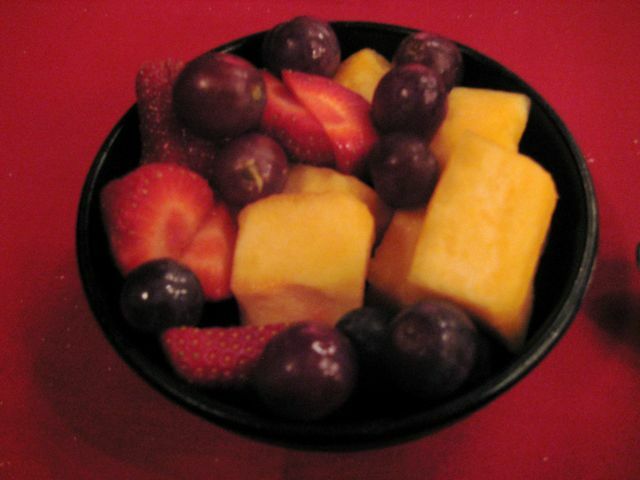 peach slices, no strawberries, and four walnuts. It was terrible! 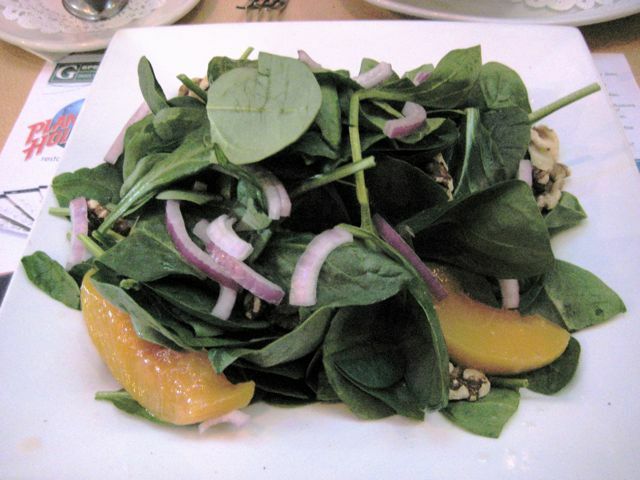 I ate all the spinach, onions, and walnuts, but couldn’t get the peaches down. And I missed the strawberries. The dressing, though, was delicious. Loads of fresh basil. The side of veggies was nice, and after a few moments I realized it would be better to mix them with the spinach, which I did. Considering it was just a couple extra dollars, it was a good addition to a plate of spinach that surely wasn’t a real lunch. Mom ordered the Hollywood Bowl, which was romaine with turkey, avocado, bacon, roma tomatoes, and diced cucumbers. It had more, including eggs, gruyere, croutons, and Thousand Island dressing, all of which she had to take off. She had the same dressing as me. She also liked her salad (except that it was deli-meat). Would I eat here again? Nope, but mostly because of the limited choices and shortcuts for actual food. From a safe standpoint and the nice chef and server, they were great. But voucher or no voucher, we wouldn’t head back! So if you read my other Kouzzina reviews above, you’ll know why we made our way back! Chef George was waiting and ready for us, and basically told us he was going to just keep bringing out food since he had been preparing for our arrival. He already knew of some of our requests, and we definitely wanted the same sampler that we had to start. Mom said for her main she wanted the stew, and I said he could do whatever he wanted for me. From there, we were in his (talented!) hands. Same sampler as earlier: olive dip, hummus, eggplant, skordaila, pepperoncini, Ener-G bread, olives, and, not pictured, warm Ener-G rolls again with olive oils for dipping. 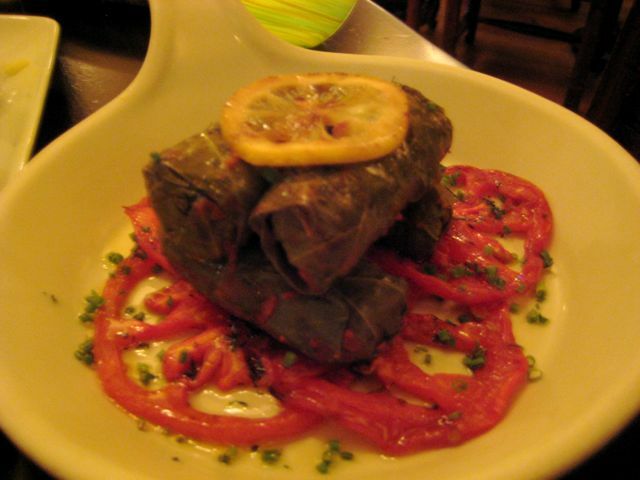 There were also some fresh from the oven dolmades, which I have never had warm, and they were so good. I need to know how to access some safe grape leaves around here. Any ideas? 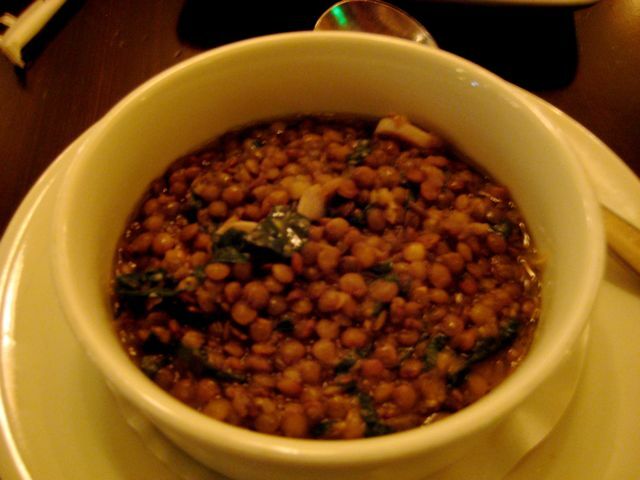 While we were still working on that, he brought us each out a bowl of lentil soup: petit green lentils with spinach, garlic, onion, olive oil, and aged vinegar. Lots of flavor for such a simple soup, and the lentils had that bit of bite that you get when they are cooked to the perfect consistency. Like promised, he brought me and mom out some vegan sushi! He even picked up a bottle of coconut aminos for us to have it with while he was out at the store getting ingredients for our meal. How awesome is that, that he picked up soy-free aminos for Mom?! 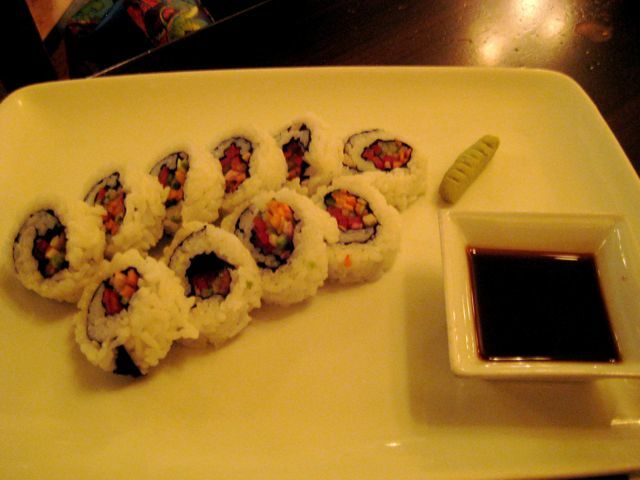 The sushi was fabulous, too. I didn’t take a photo of Mom’s main since she got the Fisherman’s Stew again, but get this–Chef George even bought soy-free Earth Balance to finish it with the butter that is supposed to be used. Amazing, eh? For mine, he used the same stuffing that is from dolmades (which is excellent, especially considering I was telling him how MUCH I love it). On the left, he stuffed a potato. The middle was a stuffed tomato. And the right was a stuffed white eggplant. 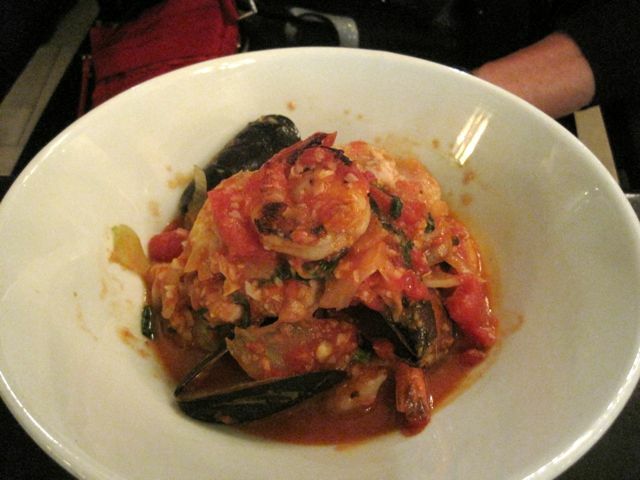 Her served that on Greek-style peas, fennel, artichoke, pearl onions, parsley, salt and pepper, in a tomato reduction. On the sides were broccoli rabe, carrots, and garlic oil. Be sure to read my other two Kouzzina reviews above! Sad news. The day after my Kouzzina meal I got full blown flu and started vomiting at 3pm on a Thursday and didn’t stop until Sunday. We left on the Friday and Thursday night was supposed to be our last, awesome dinner, and have it at Boma. I was heart broken and waited until 7pm to cancel our 8:30pm reservation. Alas, I threw up every twenty minutes, dry heaved a load, and had the worst time in the airport and getting home (with a wheelchair, no less). That being said, I couldn’t even think about Boma after that for about a week! I was really looking forward to it. I’m certain it would have been amazing, and is on the schedule for mid-trip next year… just in case. Check out my review last year for Boma. Thanks for posting your reviews! I came here after reading your posts on the Dis. I have a gluten intolerance, and I’m hoping things get better at Disney before my next trip in November. Thanks for the great amount of detail! Hi Valerie, no problem! Have you done your ADRs yet? Things were great (as you can see in my reviews); just a bit of simplicity at the counter/quick service, but table service was amazing. I haven’t made my ADRs yet. I’m thinking of doing Whispering Canyon again. I think the kids in our group with will love it. Either that or ‘Ohana. If I’m able to get to WDW the day before the rest of the group arrives, I’ll try out Flying Fish for a nice solo dinner. You’ll have to report back! I’ve never been to any of those. This is so helpful – thank you! My family and I are going to WDW in a few weeks (last year was our first time there, and we were hooked!) – I am gluten free, my daughter is gluten and sunflower seed free, and one of my sons has an extensive list of food restrictions (all of the top 8 allergens, beef, artificial flavors and colors, MSG, etc.). Two quick questions: Is maple syrup really not available throughout WDW? My son can’t do the fake stuff (plus it just tastes gross, lol) – I hate the thought of lugging around maple syrup – too much sticky catastrophe potential. :). Also, regarding Rice Dream…we learned the hard way that their milk is gluten contaminated, so I avoid that brand completely. Is their ice cream safe from a gluten perspective? I didn’t know Pacific rice milk was safe (we completely converted over to coconut milk after the Rice Dream fiasco) – that’s really helpful to know. Thanks for you help! Hi, Bernadette! I am so sorry I haven’t updated my 2013 trip yet, but I’m glad I could help. There is pure maple syrup in some places (generally the Table Service and sometimes they have it in the back). I still bring my own because I prefer our local stuff, which tastes much better (as you agree!). We just bring a small 100mL bottle. But some places do have it. Rice Dream ice cream is safe — it does have a “made in the same facility” disclaimer but I’ve called and talked to them about cross-contamination, and I am very particular (take NO chances) with dairy or gluten. Pacific Rice Milk is safe and some places have it on hand. Thanks Laurie! In some ways I feel pretty confident in my ability to navigate dining with food allergies at WDW based on our trip last year, but at the time we were ‘only’ dealing with gluten and sunflower seeds, as my son was 100% formula fed via G-tube. We have since been able to reintroduce food, with the restrictions listed above – he was such a trooper last year (not easy for a 10 year old to not be allowed to eat at all!) that I really want this trip to be special for him food-wise. Great! I hope that everything works out and I am sure it will. In the last year (which I haven’t posted yet), I’ve eaten at Tusker House, ‘Ohana (twice). The others I haven’t eaten at, ever, other than ’50s, and I have to tell you, my two experiences weren’t that great. Be really adamant about what you feel is right. The chef spent over 15 minutes arguing with me about how Kikkoman soy milk is gluten-free (it isn’t safe) and how I was “worried for nothing”. So trust your gut there! Definitely let me know how it goes, and if you even want to write up a small “guest post”, I can add it to here! Yikes – I will definitely be extra careful at ’50’s PTC. I’ll check back in after our trip!